August 1, 2013 – Cessna Aircraft Company is celebrating another program milestone for the world’s fastest civilian aircraft, the Citation X. The first production unit of the new Citation X took its maiden flight this week, marking another step closer to certification and delivery of the remarkable mid-size business jet. “The Citation X was flawless today,” said Gary Drummond, Cessna senior production test pilot and the flight’s Pilot in Command. “We took the X to an altitude of 49,000 feet on a flight pattern over western Kansas. The aircraft attained a top speed of Mach 0.935 (617 mph). The Citation X boasts two Rolls-Royce AE 3007C2 turbofan engines, each delivering 7,034 pounds of thrust. The Citation X is one of the few business jets permitted to operate at an altitude of 51,000 feet. This capability allows the aircraft to fly above most weather and avoid lower-altitude commercial traffic, translating into shorter flights. The Cessna Citation is powered by two Rolls-Royce turbofan engines. The Citation brand of business jets encompasses six distinct "families" of aircraft. Although based on the earlier Citation III, VI and VII models, the Citation X is significantly different, differing in its wing design, avionics, and engines. The New Citation X, currently under development, sees upgraded engines and avionics. The Citation X upgrades were announced in the fall of 2010. The Citation X now offers a longer cabin and greater range. The cockpit features three 14” primary displays and four touchscreen controllers for data entry and systems control. 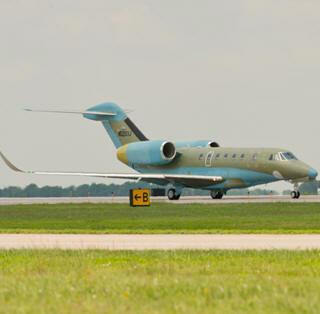 First flight of the new Citation X was on January 17, 2012. Deliveries are expected to begin early next year.